An old-Hollywood wistfulness hangs over The Finest Hours, the seafaring drama from Disney and director Craig Gillespie. The film might’ve been a stark, gritty nail-biter in the mold of far too many recent adaptations of true events; instead, we open with a lovely 1950s love story and get to the disaster in due time. 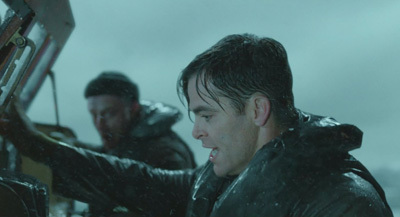 Bernie Webber (Chris Pine), a Coast Guard sailor stationed along Cape Cod, is in the process of wooing Miriam (Holliday Grainger). The townsfolk aren’t too fond of Webber; a stickler for procedure, he failed to save some local lives during a bad storm a year prior in an incident that led to a shakeup among the local military bigwigs. Miriam’s charmed, however, and proposes marriage herself; as a formality, Webber feels the need to ask his commanding officer, Chief Daniel Cluff (Eric Bana) for permission. As he works up the courage, a blizzard hits. Separately, we meet the hardscrabble crew of the oil rig Pendleton; dozens of sailors with big personalities man the ship, but awkward engine-room dweller Ray Sybert (Casey Affleck) keeps things running. When the storm arrives, though, the ship is ripped in half — with the captain’s quarters on the other side. The crew on Affleck’s side manages to rig up a makeshift radio and learns that another nearby ship has also been torn apart and all nearby Coast Guard ships are en route to that vessel.